A happy middle of the week to ya! 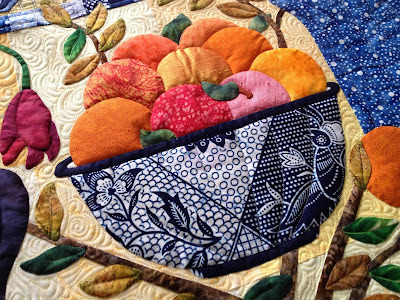 This quilt is enroute back to it's Iowan owner, as I type this. I have finished off several others since this, but they'll get shown in due course. There's a large-ish batik quilt on my machine right now that is taxing my brain a little bit. Or it could be something else. This quilt is only about 24" square, but the darn little thing took many hours on account of all that stitching. 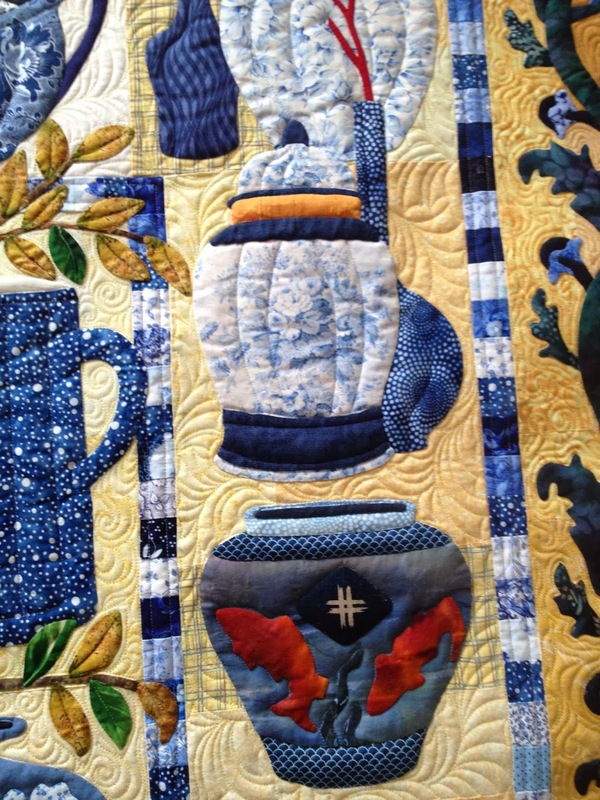 It has a wool batting, which helps to show off that pretty applique, and the relief of the quilting. I used a soft yellow (kind of maize colored) thread - 50 wt So Fine I think. I love to make the large mass of blank space carry alternate quilting patterns - hence the square on point that I added. I limited the stitching on the wool appliques to just the leaves. This type of applique can get really bulky, especially considering the fact that the flower petals all sit on top of a leaf too. I'd suggest cutting that and the backing fabric away, layer by layer, as they are appliqued. I always do this to my applique unless it is one continuous background fabric. It keeps seam lines from showing thru the applique pieces if a quilter happens to stitch on the appliques (which I often do). If you sewed the appliques well (these are machine stitched! ), then the quilt can't possibly come apart. Many quilters do not do this, but it is good practice. 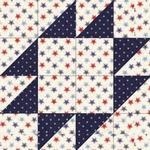 If I don't have enough things going on, it is that time when I need to be starting the blocks that will get delivered at MQX for the quilts of valor drive (QOV). Last year I did all patriotic colors, but this year I think I will do them a little differently. Here is a link that shows the three block patterns that are being collected. They can be stitched in either patriotic colors or modern fabrics/colors with a gray background. Now I will be the first to tell you that I HATE the notion of using gray. It's blah and drab, and I am just not into that modern aesthetic. But...(there is always a but), I used LOTS of the red, white and blue that I had stashed last year (I made nearly 150 blocks last year), so I am low on those colors, and not so low on some of these other bolder ones. The feature fabric on the modern block should be visibly large-scale, bold modern print or solid, no novelties, small prints or batiks. 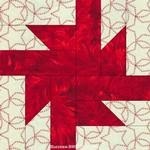 There are three blocks (shown below), but I'm not so a fan of the paper piecing, so I am looking for the one or two blocks that can be made the fastest. The Anvil (left) is relatively quick, as is Mississippi (ctr), so I am planning on them. I'm hoping to get a little help from others too (My mom did many blocks last year), so if you might be interested in donating to a very worthwhile cause, just let me know! Here's the instructions for the Mississippi block. Lay the fabrics across the background and draw a line from corner to corner on the smaller square. PLEASE IGNORE THE SHORTER LINES I DREW...I WAS TRYING OUT USING THE SCRAPS, BUT THEY ARE JUST TOO SMALL TO BOTHER WITH. 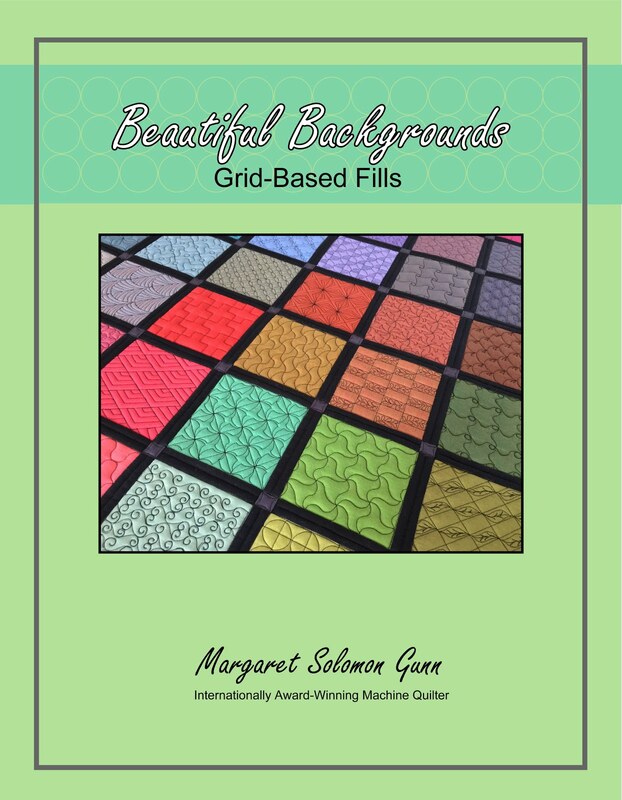 You will have four background squares done exactly like this. Be sure that the center print is always in the upper right corner. Press the 4 blocks you just created. Your layout is this. Now sew the 9 blocks together. Viola! Easy-Peasy. I will also get some directions together for the Anvil. I will make a HST sheet for those so they can be quickly mass produced on paper too. Anybody wanna make a Mississippi?? 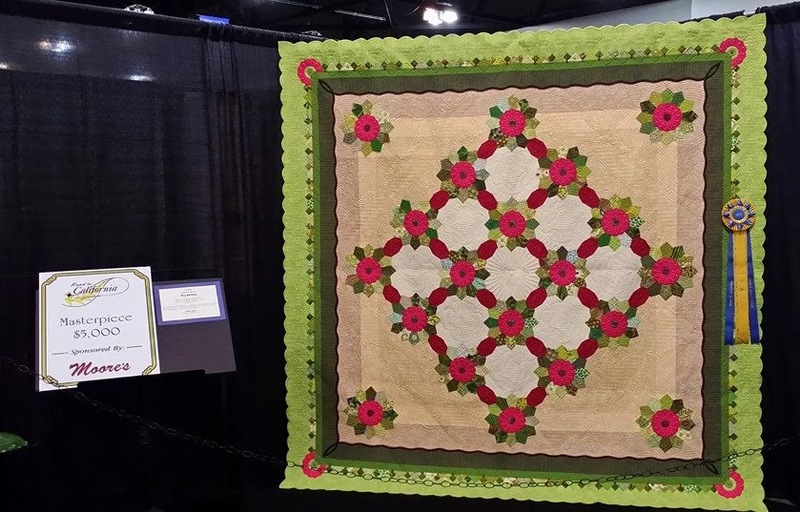 I have three quilts out at R2CA - its a big quilt show in Ontario. It is my 1st year sending anything. Two of my quilts earned nothing, but Big Bertha brought home the motherload. I am still in shock! I just finished up a very large client custom quilt. It is the 104" version of the Bali Wedding Star. It is made up of 64 rings and nearly as many other stars. 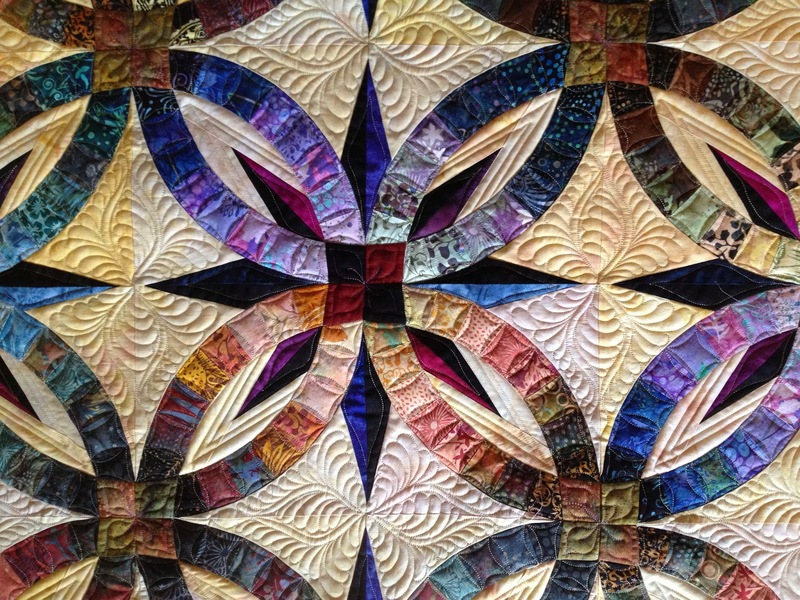 I can only imagine how very long this quilt takes to paper piece. 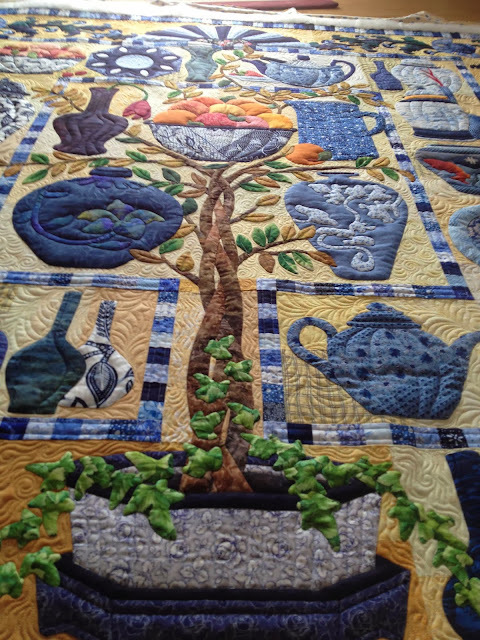 I endeavor to piece and applique large and complicated quilts, but this one just amazes me. It is certainly not my style. I get bored with piecing the top way too easily to be expected to make so very many of the same thing, one after another. Kudos to my client! She's done a really nice job of the paper-piecing. The points are mostly very well matched. The areas where the rings and points come together are naturally a point of bulky discontent for a quilter, but once I discovered them, I knew to expect them. That is half the battle. It is the unexpected pops of bulk that are harder. This client told me up front that she loves feathers. 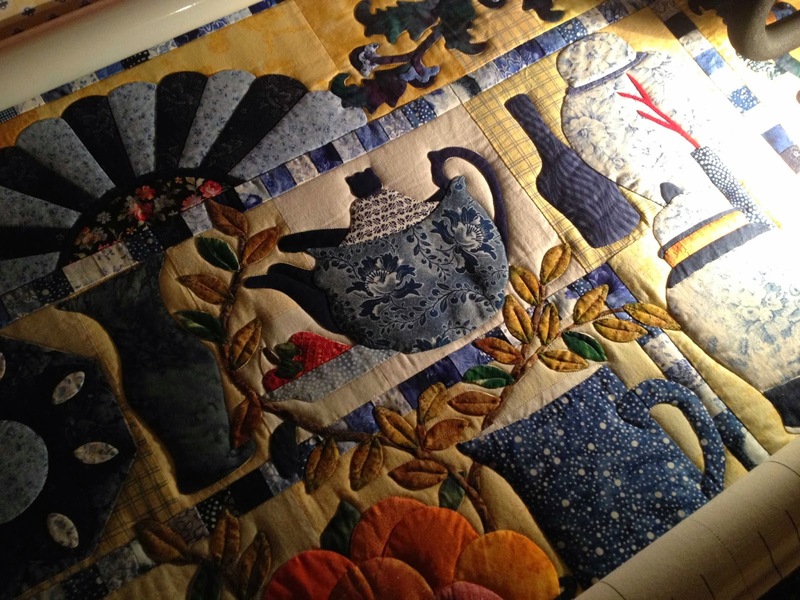 The quilt has some space for decorative fillers, but no huge expanses. 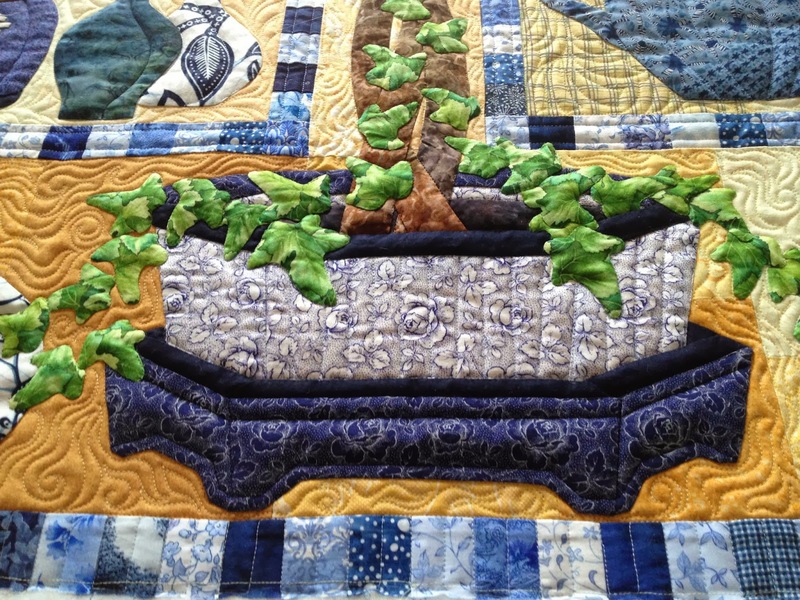 She relayed pictures of one other quilter that has quilted this quilt, but I knew I'd design something different. My beliefs on that matter are firm and strong. 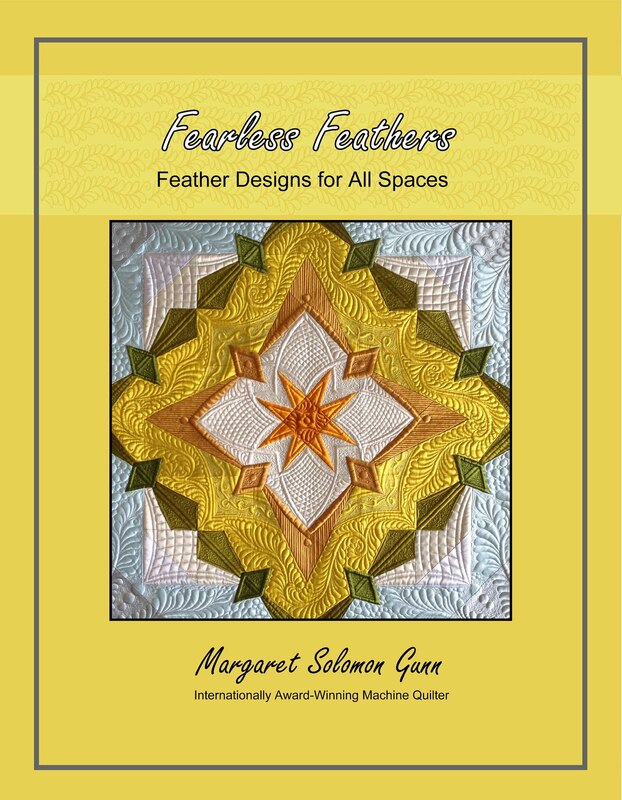 I want the quilts clients to get from me to be original and designs that I feel are fitting and appropriate for their quilts. 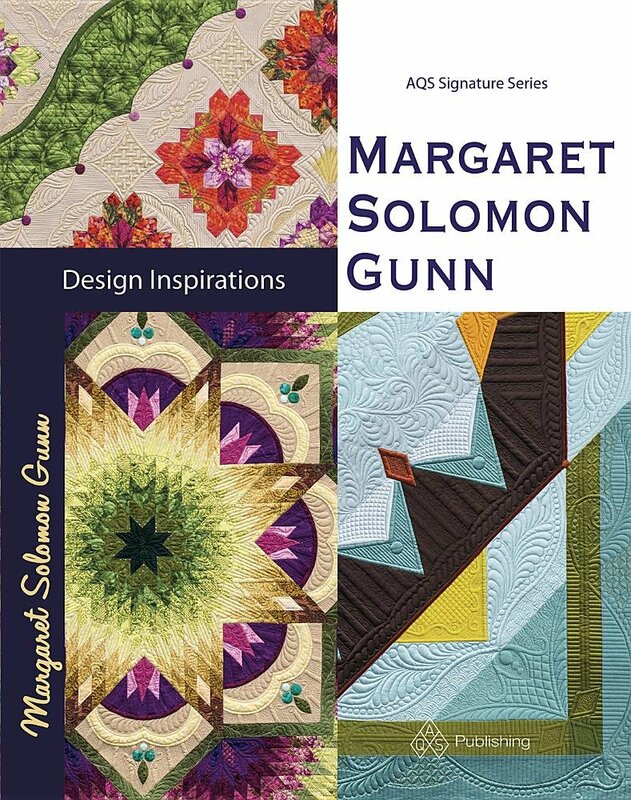 If a client feels strongly about having another person's designs copied, they oughta just go to that quilter. I heard Jamie Wallen say that in a class last year and at first it kind of hit me as shocking and crass. The more I thought about it, I am right there with him. Clients come to me because of what I can give them, my original work. So, I set to work to create a feather spray that fit the geometry (which, as shown above, is kind of awkward). These triangular holes flip-flop directions too, so I let the center of the teardrops feather in opposite directions so that it infuses some swirl to the piece. 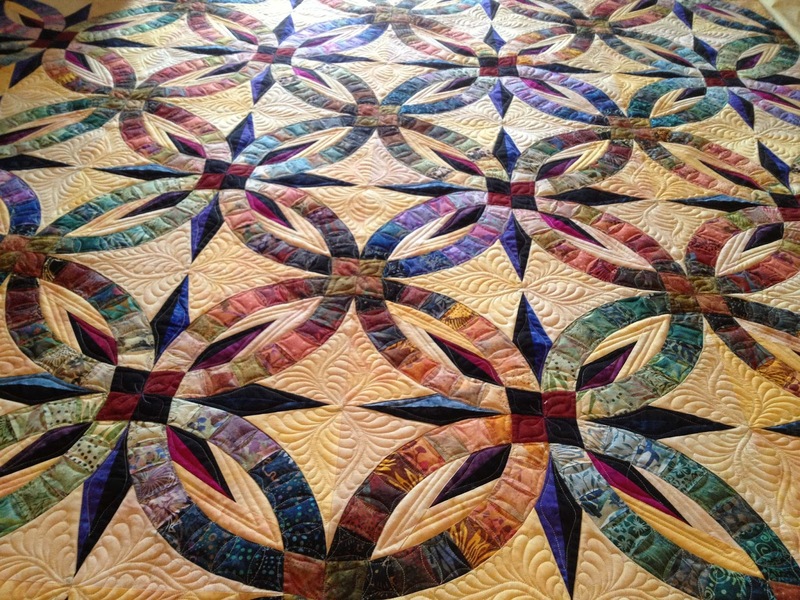 Movement is a key component to a quilt, and it is even more important on a quilt that is just a repeat of the same design over and over again. One other criteria I had was that the quilt needed relatively simple shapes (ie, no complex swirls) because I did not know if these many dark colors of batik had been prewashed. I know first-hand that several of these Hoffman 1895's have bled for me, and if not prewashed, they might have bled when I needed to remove the markings. Too many incidents with bleeding make me chicken to go out on a limb. It is a really pretty combination of nearly every color imaginable. I'm sure I'd be plenty confused putting all the rings together in the right order! I knew I wanted to do the straight line ruler work in the melons. A quilt like this needs a change of tempo. It is so curvy, especially with all the feathers. The parallel lines bring out the stars. Because I wanted these to be stitched continuously as I did the CC-ing of the rings, I chose the same Khaki (ok, it is gold!) Glide thread. 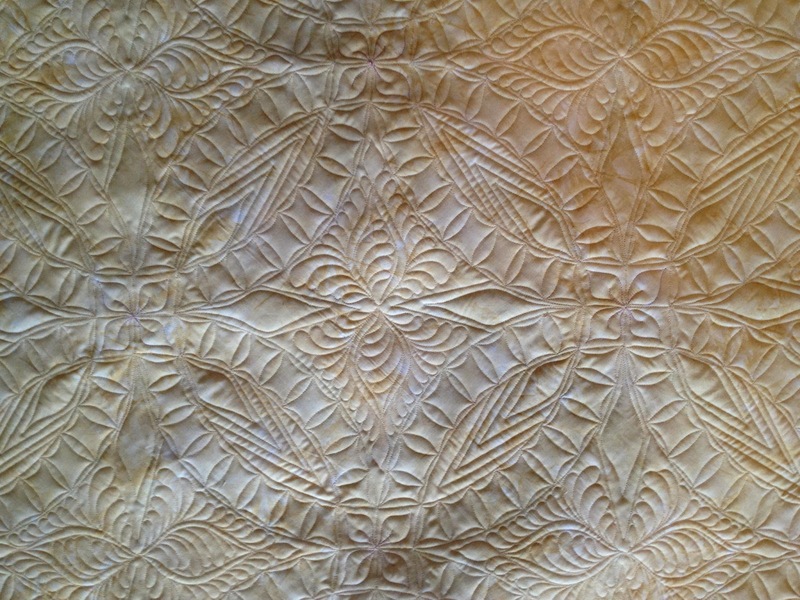 As a result, the entire back of the quilt has a pale bobbin thread showing, thereby leaving just texture. To mix it up just a little, I did the little 4-patches at the center of the stars with a variegated purple thread. I just wanted a different bobbin on part of the back, even if it is only a small bit. The back is really pretty- loads of texture. This quilt has a wool batt - Quilter's Dream I believe. Every ring and star has been ditched with monofilament thread. 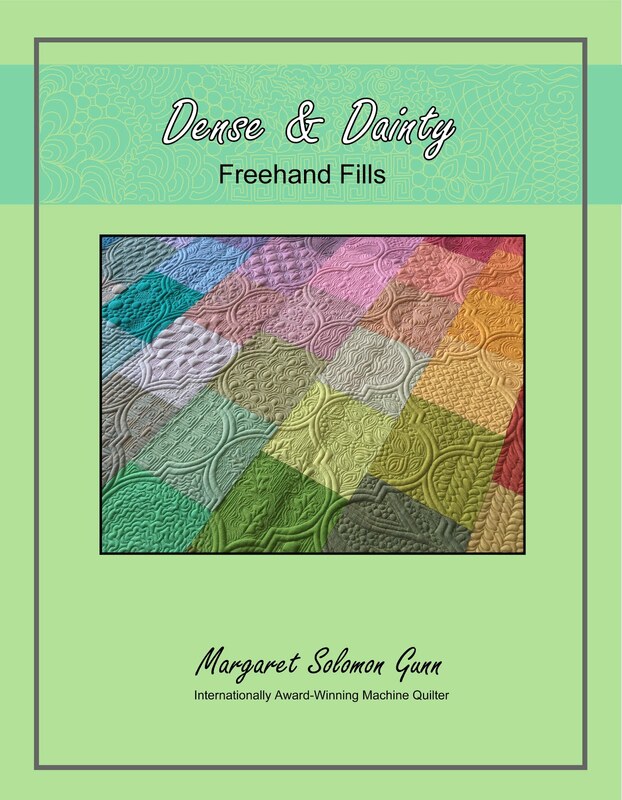 Other threads are either Khaki Glide or the variegated Aurifil 40wt poly, which I just adore!! This quilt was on my frame for a whopping 8 days. That is longer than most quilts, but it was large. Here's the breakdown... I used three-quarters of a mile of thread. The ditch quilting took 35% of the project, the feather sprays took 19%, the cc-ing of the rings and oval line work took 40%, and the last bit of purple thread in each 4patch took 6%! I never expected the rings to take THAT long...it went on and on and on!! The quilt has been mailed home on this holiday. 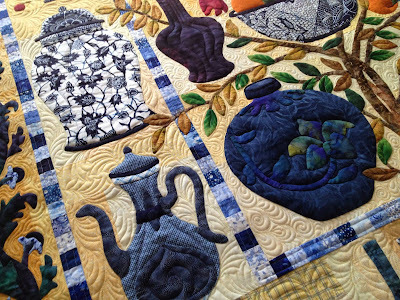 I am onto quilting three more that will go home to Iowa next week. No rest for the weary...Have a great week. BTW, anybody know where to find size #3 pearl cotton?...Went to Joann's today in search, but came home empty-handed. First...Thanks for the comments at last post. I do like hearing reaffirming comments about my initial layout. I think I will likely go back to this one. Stick with your first instincts. Second...I have received comments that I'd like to answer personally. Please make sure that you are not "blogger no-reply". If I cannot email you back, I won't. 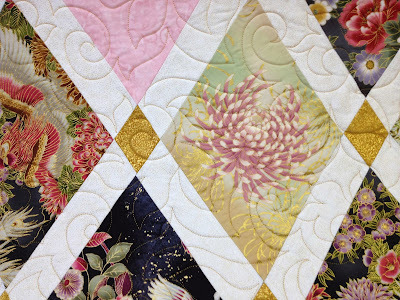 This is about the hardest and best applique quilt I have done in a very long time. It is Maggie Walker's The Blue Collection. It came out over a decade ago...I can only imagine it took my client nearly that long to stitch those on. The appliques are all needle-turned edge, and are done about as well as I would have done them. Being the applique snob you all know I am, that is pretty dang good. This quilt is about 58"x60" or so. I stopped counting when there were nearly 70 leaves for me to outline and vein. It is totally insane in a good way. This quilt has a single wool batt. This helps the appliques to keep a puffy look after quilting. It will help them to retain this puff as time goes on, when a cotton batting would tend to compress. 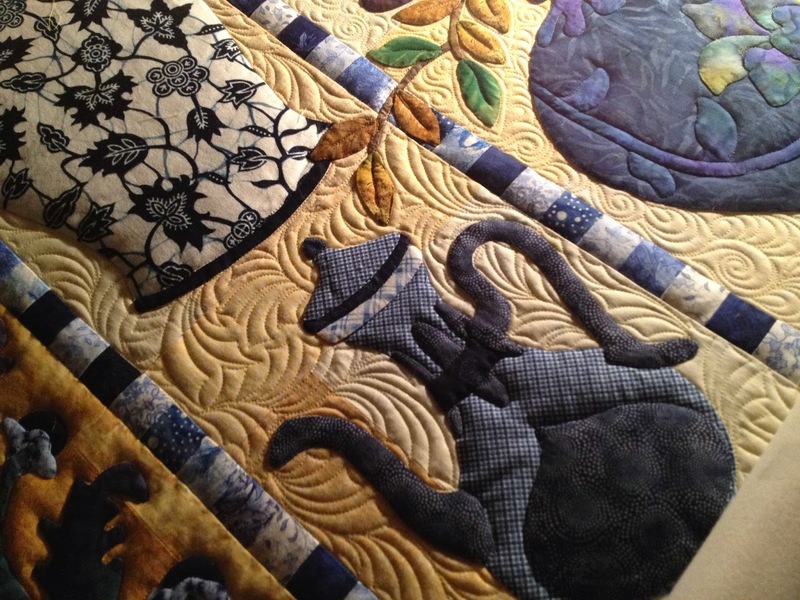 Initially when I got the quilt from the client, she really did not want any stitching on the appliques. I had to convince her that they really need to be quilted on, even if just a little. A difference in stitching density that severe would make this hang wonky. 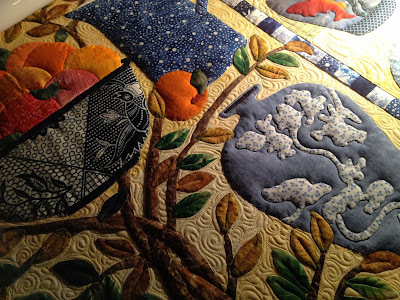 Besides, the quilt is about the appliques, and they need to be part of the design of the stitching. I chose to keep the applique stitching simple, and to the point. The pots are only quilted on to (hopefully) convey the depth or shape of the item. I outline stitched each and every applique with a Madiera Monolon thread. This keeps the edge of the shape nice and crisp. It's a tough challenge with fabrics of high contrast though. The clear thread disappears completely on the yellow background, but shows slightly as a "sheen" on the deep colors. It is something you have to deal with if you don't want to stitch part of the appliques with blue, or smoke clear thread -- which I don't. Other threads used include a pale yellow So-Fine thread and a couple shades of blue Omni thread. It is all about the texture, and not wanting to take anything away from the appliques themselves. The leafy border above is something crazy. There are about 40 of those very hard to applique leaves. In a perfect world, or a quilt with a much higher budget, I would have done some echo quilting on these. Since they would have required a stop and start for each one, I left this part out of the scope. There was a little detailing on the larger blue flowers in the corners though. Each pot or vase or bowl received simple detailing to give it dimension. Mostly, this consisted of some curved contours. The filler at the center of the quilt (above) is something new for me. I have seen something similar done, and really love how it swooshes and swishes and gives this pieces a nice dimension. 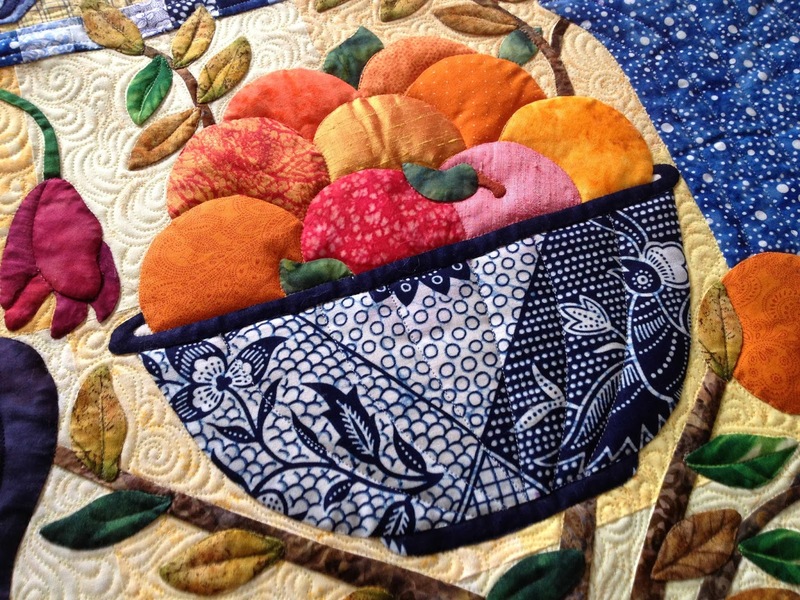 Mostly, the quilt is cotton, but there are a few nice touches of dupioni silk like these oranges. As a note, because of the blue fabrics, which I am pretty sure will bleed, and the silks, I didn't mark anything except a few curved contour lines that could be rubbed off with a damp piece of cotton. The last think I needed was to have a bleeder. I think that this flower pot conveys great texture and dimension. It is spot on! It is all such a pretty pattern and design. I just hope that the owner likes it as much as I do. 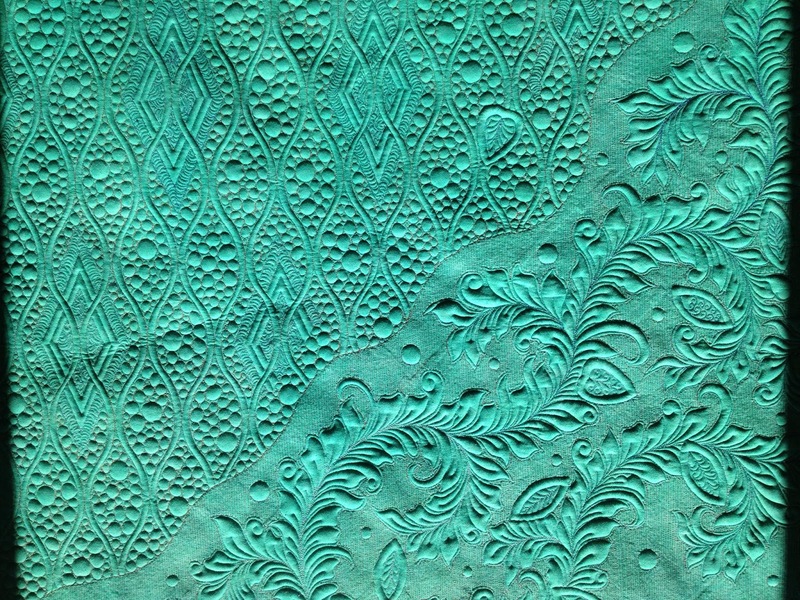 I am busily working on a Bali Wedding Star quilt for a client. 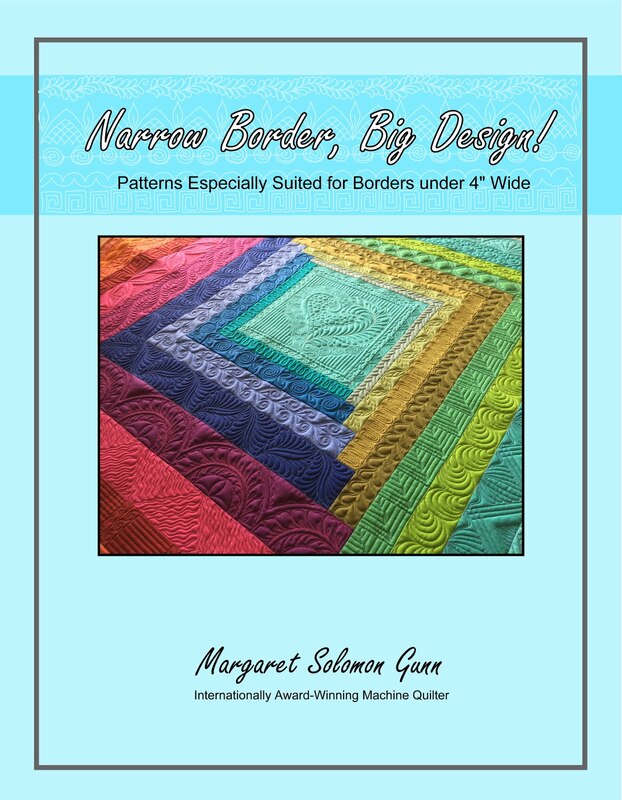 This is one that will probably go onto my list of "never quilt again" quilt patterns, right along with it's cousin the Amazon Star. 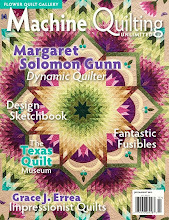 Judy Neimeyer makes lovely designs, but I just hate quilting them. This one is a monotonous 104" of the same thing after the same thing. 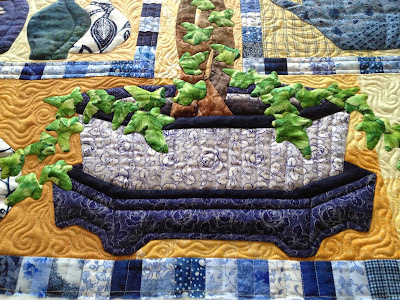 I spent over 12 hours just ditching this quilt with monofilament! I hope it will be gorgeous because it will definitely take me forever once I start on the actual quilting that will be seen! In the evenings, I have been more busy readying a quilt for the 2014 shows, so I haven't really spent much time on these blocks. I do them here and there, and when my daughter is at a dance class. I have 3 new ones -- 17 finished to this point. For some stupid reason, I decided now (after 2 yards of dark green fabric arrived this week) to play with the design layout. I ought to be shot! Now I am plagued with indecision, and don't know what I will do, or if I have enough of the green background fabrics. Here's the layout I thought I would go with initially. In many ways, I love it. It takes a basic-type layout and elevates it with the curved applique (the beige "flowers" are done from the silk Radiance). It leaves some space for quilting, but not enough that I would feel in inundated. 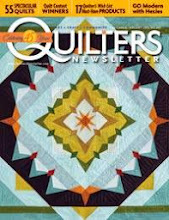 Some quilters love wide open spaces. I'm not one of them though! So this layout needs 25 blocks, and until today, I thought I knew how many of each colorway I was doing. Then I got to thinking that the layout lacked a clear central motif. The one I drafted below isn't really what is shown. It would be one of the pieced units, but with an added row or two pieced onto it. It would have a wider silk frame in the ivory. The EQ7 rendition shows all blocks being the same, but they are not. This layout needs 20 blocks. It's sounding better as I go. Five fewer. Then I got to wondering how it would look if I simplified it somewhat. These pieced block/"flowers" are busy. Maybe they are too busy. There is a lot of space here to quilt in (probably more than I really want! and this is a larger quilt by 7-8"). I would probably add some appliqued bias/vine (hard to describe) into some of the more open areas to help break them up. It has a certain look that is more grounded and less busy. Not sure if it is my favorite. Plus it only needs 17 pieced blocks, which means that I am already at the number I need (and they are not in equal numbers to fit the layout). One last tweak. I hate straight lines on quilts because they truly have to be straight or else it looks wrong. It's better to have intentionally NOT-straight lines. And it is visually more interesting, even if it is not done in that super-pale green as I have it shown. Is there a layout that you prefer over another? What about it is pleasing, and draws you to it? One more question...I want to increase my blog reading and am seeking interesting blogs. I am drawn to ones with good piecing/applique or good quilting. I really don't give a flip about the blogs for designers that make ridiculously simple quilts from fu-fu fabrics with mushrooms and trolls, etc. I am all about the substance. So, please post and give me a couple suggestions of blogs that you enjoy. I sent my silk quilt off to be photographed by an unmentioned magazine this past week. This is all very exciting, but nerve-wracking too. I always worry when they ship away in the mail. I am hoping to have it in Mid-Atlantic Mancuso show next month, along with another of mine that isn't quite finished yet. That quilt's binding will be done early this week. The piping has been giving me fits (not to mention the elephant in the room...the red and orange fabrics bled a bit when it was blocked the first time too! That is a thing of the past now) No more excuses. 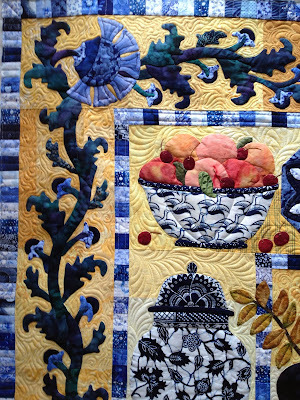 I have a gorgeous blue quilt to share detailed pictures of this week, and if there is good fortune, a Bali Star too. Despite Mother Nature's efforts to make working difficult (aka, 2 snow days when kids should be gone back to school!! 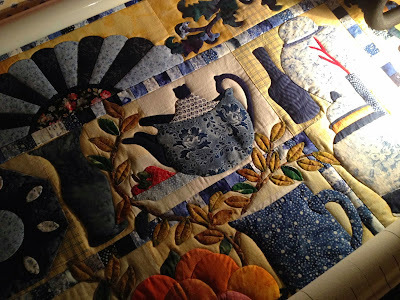 ), I am trying to get going through the backlog of quilts. Here are a couple that have a lovely Asian flair, but couldn't be more different. This first one is a very large 100x111, and thankfully, the client only wanted it E2E. Customs this large just take the wind out of your sails! 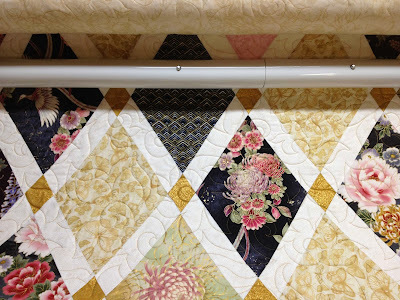 She chose the Whirlygig pantograph, which I really love, and I was most surprised how fantastic it looked on the quilt. I chose a gold YLI polished poly thread that was a great match for the gold diamonds. It was perfect. The fabrics are mostly gilded, and are just gorgeous. I especially love the gold butterflies (above...note to self "must have"!!) and the large mum (below). It's enroute back to it's Pennsylvania owner, and I just know she'll love it. 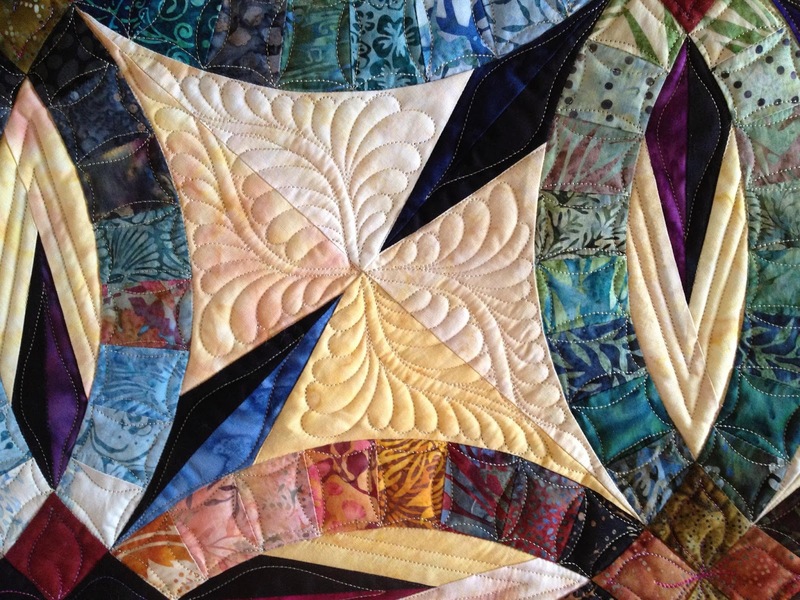 What so many quilters don't realize is that not every quilt is really a good candidate for a custom. 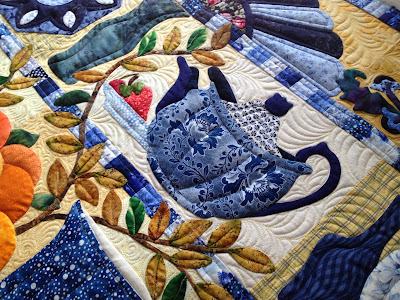 This may be a very special quilt, but it's beautiful with an all-over pattern instead of custom. Maybe better. 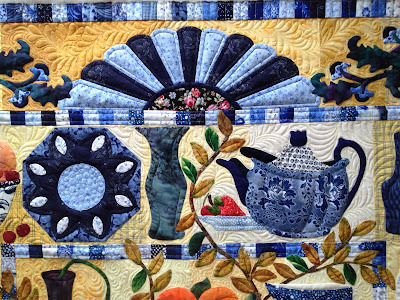 My other Asian-ish quilt is Maggie Walker's The Blue Collection. This is about 58x60. 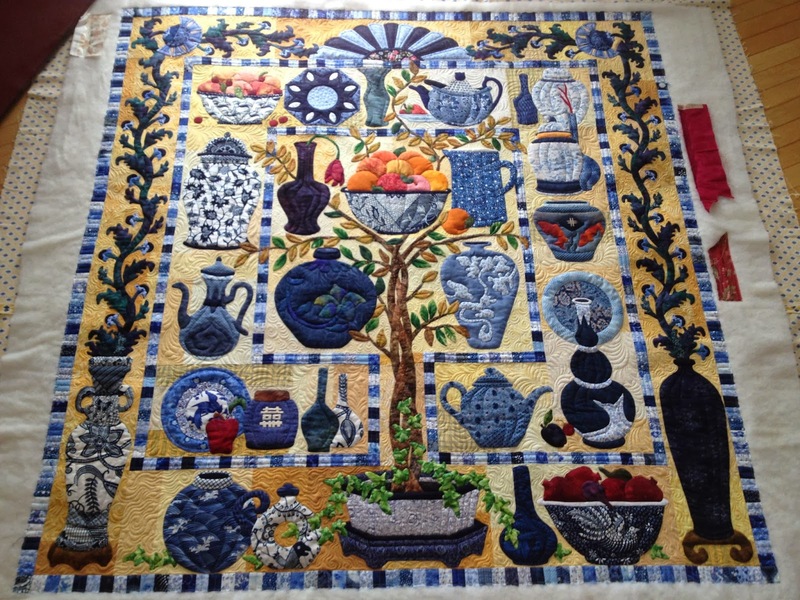 I'd probably never have done it had it been huge!...It is completely covered with appliques, which the client has done a great job of. They are needle-turned (or turned edge). It has a ton of different indigo and Asian blue fabrics. I spent 2-3 days just outlining all the appliques (while it snowed, and while the kids were thoroughly engrossed in their new electronic xmas gifts). Now I am onto filling in the yellow background. Sounds simple enough, but I have a whopper cold, and this background just has WAY too many stop and starts because of all the appliques! I am chosing a few different fills for the divided areas. This is the first time I have done this filler. 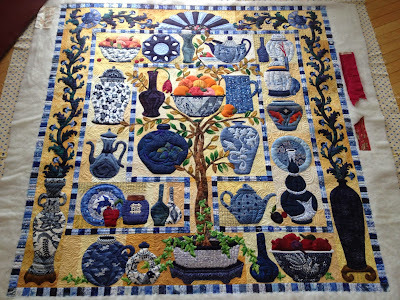 Have seen it done by another quilter, and really love it. It quilts up relatively quickly, and looks great. It works well in areas with adequate space. Around all the leaves (above) wouldn't have been so great. 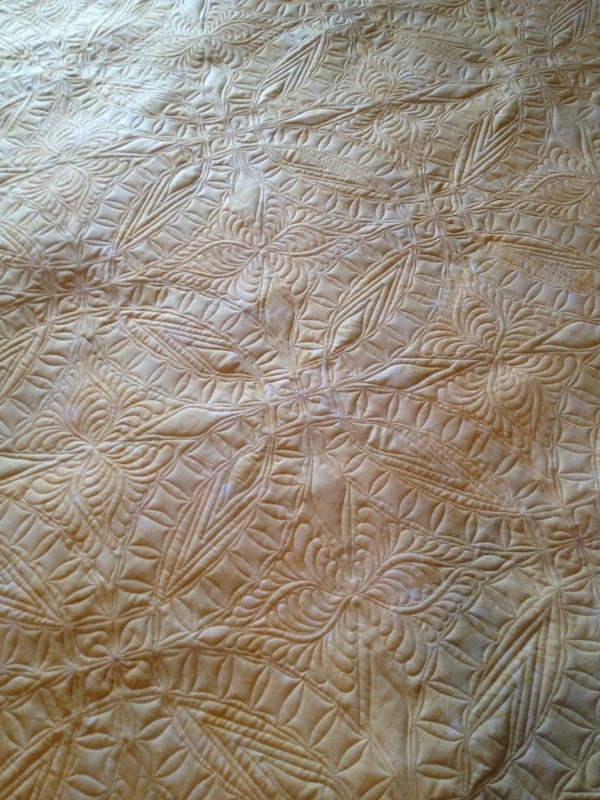 We have a wool batt on this quilt, and I am using a SoFine pale yellow thread. I'll have to do some stitching on the larger pots too in blue and white, but that will wait until Monday. If it snows Monday, I think I will just not get out of bed! This is a whopper winter thus far...awoke today to -12F (and that was at like 9am), and we have a solid 24-30" of snow on the ground. Please don't remind me that there are 3 more months of this yuck! If you are one of the unfortunate millions, you are in the path of Hercules...this week's snowstorm. It just so happens to be barreling down on New England on the day when my kids were supposed to be heading back to school. Unlike my friends in Wyoming, that never have school canceled, it is closed here with the mere prediction of snowflakes. It will most likely be closed tomorrow also, as it is not stopping until around dawn. We are expecting a foot or so (and it is a whoppig -1F, so nobody even wants to go play in it today!). So, I pulled out these blocks. I have 14 of 25 made. Today, I cut out 4 more of the central orange/peach blocks. I still have another 4 to cut out, but can soon start on the ones that are prepped. Lately, I have been busy in the evening stitching bindings on gifts, finishing the beading on a show quilt and it's sleeve. 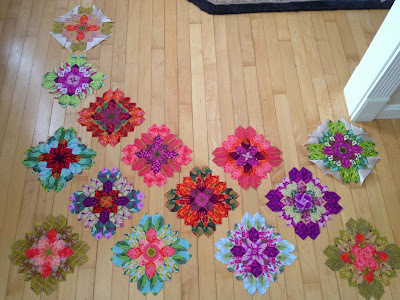 Until I get the next quilt ready for handwork, I can go back to these. They take about 4-5 hours to make to this point, and then when all are finished, I will decide what to put on the corner squares. (and the elephant in the room...add the silk to each and every one of them). It's gonna be a good long while before this is ready to convert into a quilt. I have papers cut and ready to do a 40" or so silk quilt before this is done...If kids are home tomorrow, I will get the silk soaked to bleed off any excess dye. Getting ready - I got 4 FQ of hand dyed silks in Houston, and I will use these in combination with some other silks that I have leftover from another quilt. These aren't completely representative colors, but they give you an OK idea. I am trying to avoid some of the issues I had working with silk the first time like thick seams that were hard to match appropriately. As much as possible, I am just avoiding joints that need to match.